He was coming to see me one afternoon - I was still living with my parents then - and his coming in woke up my father. Instead of apologizing, he said, in an indescribably gentle way, raising a hand as if to calm him and walking softly on tiptoe through the room, "Please look on me as a dream." It was the first warm day in a very long time. Where better to experience it, I asked myself, than Hamilton harbour? And why not enjoy a stretch of it I've never seen before? Since one of my goals as a Hamilton photo-essayist is to document every street and every view my favourite city offers. Rather the way Eugene Atget set himself to document the entire city of Paris. After consulting Google Maps to make sure I wouldn't be trespassing on private roads (there's no teacher like experience) I settled on the north end of Wentworth Street for my launch. The smell of industry wafting across the water! The almost-spring sun! Rust on freighters that one can almost taste! It's enough to move the heart of any man who began his life in Regina, Saskatchewan, a city in which a small boy could barely believe that land masses edged upon vast bodies of water, and could only dream of what those edges might be like. That's my car parked on the far right of the frame. If you have time on your hands and want to track Mark Fenton from station to station along the singular and all too brief path he calls his life, feel free to zoom in until you can make out his licence. Then look for him on the streets. He could be anywhere at any time, and if you wave, he'll make every effort to wave back in an indescribably gentle way. Making this information available on line might also save police and security forces some drudgery - but I'm getting ahead of myself. The interesting thing about the neighbourhood is the placement of residential streets next to the truly striking geometry of the Biox, Biodiesel production facility. "At last," I thought, "I have found an industry that hasn't secluded itself from the gaze of residents. Perhaps workers at the plant even live on this street! An enviable commute indeed. Rubber from the soles of work shoes on 50 metres of sidewalk would be the only emission. What an exemplary environmental footprint (literally) that would be!" on a similarly gorgeous day. I'm hoping the Google guys had an equally edifying exchange with the security guard, who I want to emphasize, was a model of crisp, clear communication. I didn't know how to respond to so peculiar an accusation. Sometimes nothing but a non-sequitor will do. I commented that it was a lovely afternoon to be out by the water. He gave a quick and decisive acknowledgement of the loveliness of the afternoon, though with so little emotional disclosure that I wager I would look long and fruitlessly for poker tells on his person should I have the misfortune to go up against him in a round of Texas Hold em. He then informed me that he would have to report the incident to the Port Authority. There was, in his voice, the faintest tinge of sadness for a society that fails to meet the needs of those citizens who fall between its cracks due to psychic challenges over which the afflicted have little control. He left. Walking southward onto Burlington Street I discovered a beautifully undeveloped municipal green space extending some 40 feet back from the road and stretching perhaps 100 metres east and west. An oasis amidst industry and transport in which pedestrians might pause to enjoy unspoiled, uncultivated nature. b) I was not to trespass on it. I would never knowingly trespass on land maintained through our tax dollars. If I came as close as I did to violating this directive, it was simply because I was not familiar with the red ball on a white background as a municipal signifier for interdiction. I can only assume it stems from a period - a period I seem to have missed - of Hamilton's occupation by Japan. I realized it must function like the Zen meditation garden in Kyoto. Wherein people find serenity not by walking up the rocks and touching them, but by remaining outside the garden and looking in on the profundity the stones contain by merely being. I thought of Christians who make pilgrimages to the shrine of Our Lady of Walsingham, that Richeldis de Faverches created to commemorate her vision of Mary in 1061 a.d. I thought of Elvis worshipers who travel to Graceland. In any of these examples, the pilgrim rests before something non-sentient and opaque and finds spiritual revelation therein. This I now did with the Burlington Street Greenspace. But I didn't experience serenity. All I could think of was a sign referenced repeatedly in Malcolm Lowry's Under the Volcano. A prohibition rather than an invitation. ¿Le gusta este jardín, que es suyo? Do you like this garden, which is yours? Make sure your children don't destroy it! If God had placed Adam and Eve outside the garden in the first place, had kept them free of any temptation to go in, our civilization might have avoided the mess it's in now. pretty much proves this. For crying out loud, the fact that I just went to the north end of Wentworth Street proves this. Adam and Eve would have gone into the garden just because it was roped off and God would've been rilly mad, and sent them out and employed that Cherub with the flashing sward to keep them out, and history would be much the same as it is now." This is a picture by Michelangelo showing what I've just described. So I didn't break the law. I really do try to respect places people don't want me to be. As I returned to my car I felt only admiration for peace officers and security guards everywhere. Perhaps, I thought, these people really do have my best interests at heart. All those people dedicated to keeping me safe from myself. I thought of the lyrics to "Don't Worry About the Government" by Talking Heads. Humming these stirring lines as I drove back to Burlington Street, my reverie came to a screeching halt. A Port Authority vehicle had clearly seen me leave and scooted around the block so as to approach me from the opposite direction and cut me off. He had none of the curt politeness of the security guard I'd met earlier - he wasn't as well groomed, either - nor did he share the ability of the first guard to maintain as little expression as Our Lady of Walsingham. Oh, no. This gentleman registered a lot of expression. He rolled down his window, motioning me to roll down mine. I complied. "You were taking pictures of a private facility!" It was not a question. It was not friendly. I would like to have raised my hand to calm him and said, "Please look on me as a dream," but I possess none of Kafka's natural elegance. I knew that as a greeting this gesture would be seen as aggressive and would have given my new acquaintance the opportunity to have my car swarmed by Port Authority patrol vehicles. So instead I responded truthfully, though perhaps elusively, that "I was taking pictures." I was then informed that what I had done was strictly forbidden (and informed of a lot of other things I didn't fully register because I was keeping an eye on the sea of traffic our vehicles were encroaching upon). I do remember clearly that the first burst of oration ended with a pointed finger and the words "I have your licence plate!" - this had been stated a few times already - by which I assumed he had a record of its alphanumeric sequence, not that he'd unbolted the plate while I was on my walk and was keeping it in a safe. He had a lot more to say, but the light had turned green and so I smiled as politely as I could, did my best impression of the Kafka wave, and proceeded through the intersection. I often imagine I will make a new friend on one of my walks, but this tour is fairly indicative of my success at that. I think one of the reasons I'm able make these trips into hostile territory is that I am blessed with a peaceful domestic life. Home is a really a nice place after being reminded for the millionth time that I haven't mastered the art of going to and fro in public space. Of course, there are quirks of adolescence that I find puzzling, that in some cases I might almost call exasperating. One of these is an odd prejudice against eating vegetables; or more specifically against eating vegetables prepared in certain ways. This evening I had stir-fried vegetables in (I thought) a particularly friendly manner, cooked but still crispy. On clearing the dishes I discovered that one of my daughters had left her portion largely untouched. I asked the reason, to which she answered: "They didn't feel comfortable in my jaw." I know it contravenes all conventional wisdom about preserving information in the office world, but lately, when I'm far from my desk, I've taken to rolling up my left sleeve and writing data quickly on my arm in fountain pen. I'll admit that this tactic may have an adverse affect on my corporate-culture image - an image, you've guessed, that is already tenuous - but I believe that my track record for retrieving the information I've transcribed at the crucial time makes up for that. So, because my daughter's response was so cryptic as to be almost koan-like, I notated it on my arm for further use and asked her to photograph it. Bland as the designation is, I suppose I can correctly be described as a family man. There are worse things to be. And after the dishes had been cleared and the kitchen cleaned up, I relaxed on the couch - as family men do - and diverted myself with the stories of Franz Kafka. Not surprisingly, my attention fell upon a single page story entitled "The Cares of a Family Man." The story depicts the movements and conversations of a tiny creature named Odradek, described as follows. At first glance it looks like a flat star-shaped spool for thread, and indeed it does seem to have thread wound upon it; to be sure, they are only odd, broken-off bits of thread, knotted and tangled together, of the most varied sorts and colors. But it is not only a spool, for a small wooden crossbar sticks out of the middle of the star, and another small rod is joined to that at a right angle. I asked my elder daughter to draw this. Odradek shows up in the strangest places, when least expected. Our narrator will often go months without seeing Odradek, and assume Odradek is residing in other homes, only to rediscover Odradek in the garret, the stairway, the entrance Hall. When addressed Odradek speaks softly and laughs, but it's a hollow laughter "with no lungs behind it...like the rustling of fallen leaves," and he states that he has "no fixed abode." "...the fact that he is likely to survive me I find almost painful." The story has had countless and varied interpretations, many concerning the precarious status of German-speaking Jews in Prague (as the Kafka family were) in the early decades of the 20th Century. My personal interpretation, writing as a family man, is a mundane domestic one. Though never a parent himself, Kafka lived at home most of his life and had three younger sisters, Elli, Valli and Ottla who, in this photo, represent the apotheosis of domestic harmony, security and general goodness. I know nothing of everyday life in a Prague home circa 1900, but I suspect mothers and daughters made a significant contribution to sewing and mending the family apparel. Despite the fact that my daughters do a fair bit of sewing and knitting, odd spool-like things never materialize in crannies of our house. For years, though, I've come been acquainted with a similarly unique and tiny creature, who I call Odradek for the 21st century. Being the growing teens my daughters are, I encourage them to eat nutritious snacks. The snack of choice in our household is the single portion yogurt. I have no objection to this. It's a comparatively wholesome snack. It's preferable certainly to the countless post-industrial, post-food edibles packaged in that crinkly plastic you aren't supposed to recycle, and which snacks our convenience stores are full of. So, yes, I'm happy my daughters favour yogurts over the above. However, in the wake of these feedings, Odradek For the 21st Century (hereinafter referred to as OFT21C) materializes in the strangest places. OFT21C consists of an emptied yogurt container, from which a metal spoon protrudes, its head hidden in the depths of the container. Sometimes OFT21C lies next to its shed skin! like lepidoptera who have passed the pupal stage and jettisoned their cocoons. I am not sure that OFT21C is a thing of strength or vulnerability. I only deal with OFT21Cs if I'm absolutely forced to, leaving their disposal to my daughters who I contend are responsible for their creation (though I can't be certain of this.) Once I was horrified to discover that having rested inert for some hours an OFT21C had been violated by an apple core! This was disturbing to me. I sometimes come across an OFT21C cluster. complete with shed skins. You can see that in my world OFT21C is hardly a lone individual. OFT21C is a species. A sort of pest that will overtake the household if I don't stay on top of its reproduction. Some months OFT21Cs can, like our mice, be kept back, but they always return. When asked, OFT21Cs do not answer that they have "no fixed abode." Instead they say, "Oh, we're everywhere, and always will be." And their voice is not hollow. It emanates from the floor and the ceiling and the walls, like the buzzing of a thousand bees. While Kafka's Odradek was a dispossessed creature who endured against slender resources, my Odradek is a drifter who thrives amidst overabundance. He is no longer the byproduct of a society in which families have to produce household goods for themselves. He is now the byproduct of a society so distant from production that consumption is taken for granted. Odradek is an item on a long list of 21st Century waste, waste that mostly I tolerate, but that on occasion encroaches to a point whereat I flee madly to the perils of Hamilton's docks. But tonight I don't feel like heading into Hamilton's dark places. No, tonight Prague is on my mind. Even after I put down Kafka, I sit at the computer and scroll though images of this great, medieval city. August 1968. The date is uncertain. Either the 22 or 23. 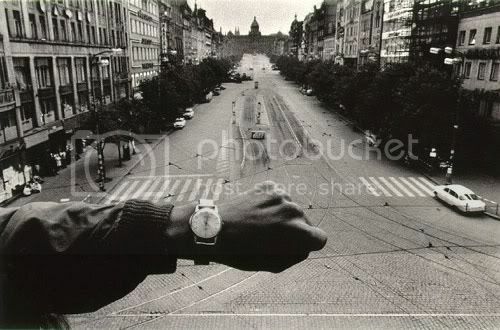 Josef Koudelka stands on a roof or a balcony with a birds-eye view onto Prague's Wencelas Square. A demonstration against the Soviet occupation has been scheduled for 12:00 noon. Koudelka isn't wandering the docks to record quirks of a moribund industrial city and eliciting the wrath of security guards who, really, have pretty strict limits on what they can do to a guy with a camera. For Koudelka the stakes are high. But the assembly has been aborted. The square is empty. Koudelka records this. If he doesn't give us the exact date, he at least gives us the exact time: 12:22, which he documents with a wristwatch. Had the technology existed in 1968, a digital timecode would be both more accurate and less obtrusive. But a photo with a timecode and no arm wouldn't have held our collective attention for 43 years. Perhaps because it's the simplest of martial gestures, the photo speaks louder of the Soviet occupation even than Koudelka's photos of tanks and soldiers and frightened civilians. As I close out of my browser, I notice that a bunch of OFT21Cs have sprouted around my laptop. I sense they're cackling at me. I scoop them up for plastic recycling and insert the spoons into the dishwasher's cutlery holder. and kept it in a zip lock bag by her bed to bring her good fortune. How many Odradeks might I have seen on something I was frying, had I but looked? Kafka died of complications from tuberculosis in 1924. Though only a month short of his 40th birthday, the manner of his death was enviable by comparison to that of his sisters. The Nazis deported Elli and Valli to the ?ód? ghetto, an industrial site where those interred produced supplies for Nazi soldiers and police squads. It is uncertain whether Elli and Valli died in uprisings there or were sent on to death camps. Whatever the case, history lost track of them before the ghetto was fully liquidated in 1944. Ottla had married a gentile, which gave her protection for a while. However, feeling obligated to her community, she accepted deportation to the Terezin concentration camp in the northwest of what is now the Czech Republic. From there she volunteered to accompany a trainload of children to an unknown destination, which proved to be Auschwitz. When the train arrived on October 7th, 1943, the 1,267 children and their 51 guardians were gassed. In a story that, so far, has proven deathless, Odradek has outlived all of them. A fact for which Kafka's word "painful" is stunningly inadequate. An entertaining and vocab-enhancing read, if rather long (so much for that 800-word article cap!). Long and leisurely, mind you. Perfect for dawdling over. Mark - I absolutely love your work- keep em coming! Loved this article. Two solid laugh-out-loud moments and an uncommonly poignant ending. Very nicely written. any work of defence belonging to or occupied or used by or on behalf of Her Majesty, including arsenals, armed forces establishments or stations, factories, dockyards, mines, minefields, camps, ships, aircraft, telegraph, telephone, wireless or signal stations or offices, and places used for the purpose of building, repairing, making or storing any munitions of war or any sketches, plans, models or documents relating thereto, or for the purpose of getting any metals, oil or minerals of use in time of war. Every person commits an offence who, for any purpose prejudicial to the safety or interests of the State, approaches, inspects, passes over, is in the neighbourhood of or enters a prohibited place at the direction of, for the benefit of or in association with a foreign entity or a terrorist group. So far as I can tell, you photographed this facility on the direction of Franz Kafka, and, famous novelist though he may be, he certainly also qualifies as a "foreign entity". Could Mark Fenton be fated to reprise the role of Josef K.? What could be more appropriate, really, for an updated version of The Trial, than Mark F., charged with photographing a prohibited place named Biox at the behest of a long-dead existentialist Bohemian? Further to Adrian's comment about the sad fate of Josef K. here's what happened at literally the moment I clicked SEND for Ryan to edit the above essay. I work in a secluded spot and it's easy to get sloppy about locking our vehicles in the office parking lot. Just as I was relaxing in my chair in a "glad-THAT'S-finished" posture, a co-worker walked in and informed me that he'd just come into the parking lot and noticed that there was a police officer sitting in my car. (For the record, I sit by the doorbell of the building and it had not rung.) My co-worker naturally approached the officer and asked if there was anything wrong. The officer answered that he'd noticed an open window, and this is often the sign of a stolen vehicle, and in any case, it was raining and he thought he'd best wind it up. Granted it's a Toyota Echo (see photo above) with crank windows, but I personally have never needed to be fully seated to wind the window up. If you remember monday morning you'll know I would have driven to work in fairly heavy rain and it seems unlikely I'd have driven up with a window opened more than a crack. This investigation happened several hours later and there was no wet upholstery when I went down to the car to see if there was anything worth a photo essay (it all looked the same inside, the usual disaster of CDs and expired parkade slips, empty coffee cups and crumpled google-maps printoffs). My coworker says he informed the officer that the owner of the car was in the building and the officer returned to his own vehicle and drove off. I can only attribute the occupation of my Toyota Echo to a licence plate search which flagged myriad suspious, if not actually illegal, activities on the part of the registrant. I have no way of knowing. I believe the appropriate word is Kafkaesque. This morning I locked all the doors. I have been stopped and questioned (politely) many times for photographing the sights along Burlington St at night - usually security has been quite polite and only needs to hear that I take pictures for fun and that I am not planning on cutting the fence etc. But I am sure that my plates in a shared database of weird people who take pictures in the dark.